1 photograph; b & w; 5.25 x 3.25 in. 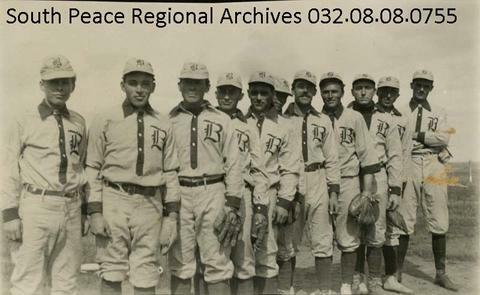 The Beaverlodge Baseball Team in 1914: Johnny Johnson, Marley Sherk, Vic Burt, Homer Jaque, Ralph Carrell, Harry Newgard, Percy Lu, Harry Cranston, Ed Heller, Herman Reiderick, and Hugh Allen. The photograph may have been contributed by E. J. Heller.